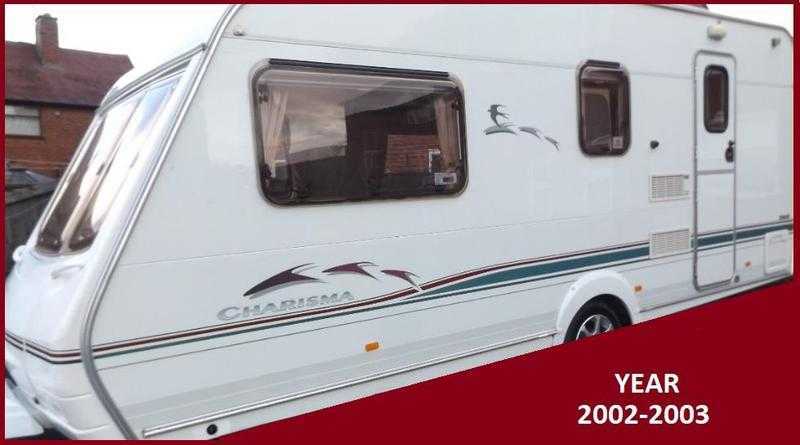 Home › North › For Sale › Rvs › Swift 4 Berth Luxury Touring Caravan Ace Sterling Abbey Group BARGAIN. Swift 4 Berth Luxury Touring Caravan Ace Sterling Abbey Group BARGAIN. 2002-2003 Modern Family Touring Caravan New Shape. Only Selling Due To Upgrade In The Summer. Our Caravan Has been Well looked After And Is In Excellent Condition Inside And Out And It Shows. Everything Works As It Should On Gas And Electric. For More Information Manchester 07771723310 077717233...(click to reveal full phone number) . This Model Is very Popular - A Large Front Bed,Side Dinette/Bunk And Rear Private Bathroom. Very Spacious With Lots Of Storage space in Upper Lockers and Below Seating. FRONT - Large Seating/Sleeping Area Converts Into A Double Bed or Leave As 2 Singles And During The Day Accommodates 4 Comfortably For Dining. SIDE DINNETTE - Sleeps 2 with 1 On The Lower Bed And 1 On The Upper Bunk Complete With Privacy Curtain Cushions And Ladder. REAR PRIVATE WALK IN BATHROOM - Separate Walk In Shower,Separate Modern Toilet, Vanity Unit And Wardrobe. Plenty Of Storage For Plates Cups etc. Above and Below Cooker/Sink Area. COOKER - Full sized Cooker Hob with 4 Gas Rings,Grill and Oven. FRIDGE - A Good Sized Fridge With Freezer Compartment - Gas And Electric. WATER HEATER - Modern Thermostat Type - Supplies Hot Water to Sink Taps And Shower.Gas And Electric. FIRE/BLOW AIR HEATING - Modern Thermostat Type - Gas And Electric. Modern Large Front Skylight Letting In Lots Of Sun Light. Lots Off Lighting Including Spot/Reading Lights (Adding The Cosy Relaxed Feeling). Electric Mains Hook Up Lead.